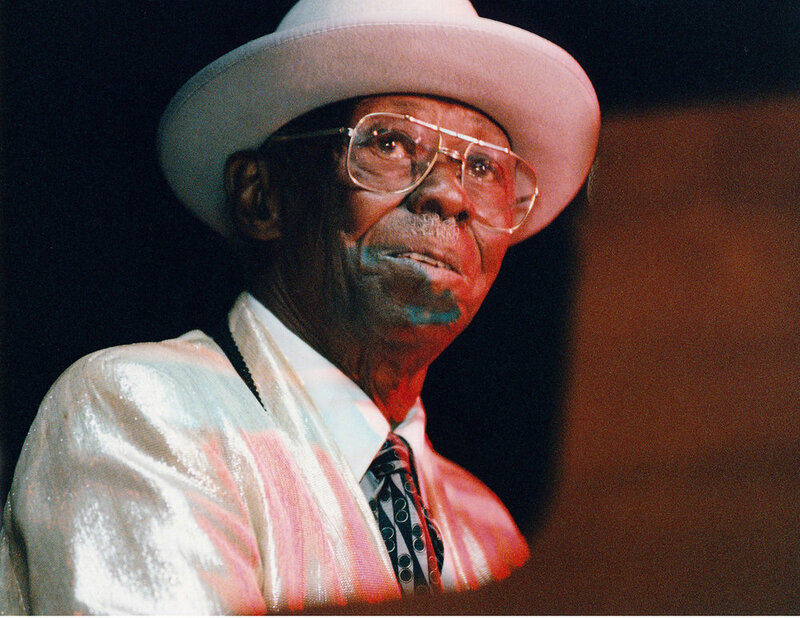 Joe Willy "Pinetop" Perkins was a blues pianist who played in Muddy Waters band. Born in Belzoni, MS. in 1913, he won a grammy award for Best Traditional Blues Album at the age of 97, the oldest ever. In 2004 he recorded "Last of the Great Mississippi Delta Bluesmen: Live in Dallas" with Honeyboy Edwards, Robert Lockwood Jr. and Henry Townsend. "Sidemen: Long Road To Glory" is an award winning documentary film about the lives of Pinetop Perkins, Willie "Big Eyes" Smith and Hubert Sumlin. One of my favorite blues photos is of Robert Lockwood Jr. and Pinetop Perkins, two of the last original bluesmen, posing together before a show at Wilbert's in Cleveland in 1998.
top photo: Robert Lockwood Jr., left, and Pinetop Perkins; Cleveland, OH. in 1998.
bottom photo: Pinetop Perkins at Pocono Blues Festival, PA. in 2000.